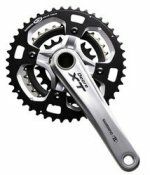 The Shimano XT Chainset is a high performance mountain bike component, engineered for the way you ride from the classic ATB group. Models are M760, M761, M770, M771. For example the XT M770 features: Forged HollowTech II aluminium cranks offer unrivalled strength-to-weight ratio. Lightweight construction with external super smooth bottom bracket bearings for efficient use. Drilled steel and carbon composite construction middle ring combined with a thicker aluminium double anodized 44 tooth, and plated aluminium 22 tooth ring for excellent rigidity and durability. SG-X chainrings delivering a smooth precise shift and are Hyperdrive compatible. Stiffness and strength increased with advanced design due to wider spaced bearings and oversized axle. Weight(g): 853. Bottom Brkt Type: Hollowtech II. Use: All Mountain, Cross Country. PCD/BCD: 104/64. Spider: 4 arm. Chainrings: Triple.